Analysis of the lifespans of Patriarchs and rulers in the Old Testament shows that the lifespan values over time clearly define a sigmoid curve. There is a regularity and order in the data that does not support the idea that Old Testament longevity values are mythological or manipulations of the Hebrew writers. In the light of the ageing process and mortality rates in modern populations, it appears that changes in longevity of these Old Testament personalities can be related to two orders of magnitude acceleration in the rate of ageing of individuals since the Flood. Acceleration of ageing could conceivably be attributed to two major effects taking place —progressive changes in the genetic control of ageing and progressive changes in environmental conditions that would accelerate cell deterioration. Figure 1. Life spans of Old Testament individuals as a function of date of birth in years BC. The triangles on the abscissa represent major events: creation of Adam (C), the Flood (F), the Exodus (E), the fall of Jerusalem and deportation (D). This paper first examines the lifespans reported in the Bible in order to understand the nature of the longevity distribution at different periods in the history of the Israelites and its change with time. Those ages are then interpreted in the light of the characteristics of the ageing process and mortality rates in modern populations. Finally, some suggestions are given for a possible explanation of the principal characteristics of the Old Testament lifespan distribution. Since this paper seeks to study the natural lifespan characteristics portrayed in the biblical record, only persons dying from natural causes are included (Table 1). In all, 38 lifespans of individuals dying of natural causes were found. A date of birth was assigned to each individual. In the period from Adam to Abraham, a relative date of birth was first computed directly from the genealogical records given in the Massoretic text of the Book of Genesis. From Abraham to Jacob, the relative date of birth was calculated from the biblical narrative. The ‘absolute’ dates were then calculated using 2166 BC for the birth of Abraham which corresponds to a date of 1948 after Creation (adding all the ages of the patriarchs at the time they became the fathers of the next person in the genealogy). The BC date for Abraham is based on a date for the Exodus of 1446 BC.2 For the dates of birth of patriarchs and rulers from Joseph onwards, reference has been made to the data given in Hill.2 It was not possible to determine a reliable birth date for Levi, Kohath, or Amram. Their lifespans are listed for completion but were not used in the analyses. In the end, a data set of 35 entries was considered. Column 3 in the table shows the date in years before Christ (BC). Figure 1 is a plot of the 35 lifespans as a function of date of birth in years BC. It is immediately apparent that the lifespans are not a random or incoherent set of values but that they form a well-defined and regular series with time. Notice how the ages of the prediluvian patriarchs are fairly uniform and run between 895 and 969 with the exception of Lamech (777 years). Following the Flood (F), however, the lifespans drop rapidly and consistently with time. It is interesting to notice that although Shem was born before the Flood he lived most of his life of 600 years after it. The values of the age at death in the period after the Flood from Shem to Terah are between 600 and 148 years. The lifespans from Abraham on continue dropping but at a much slower rate. They run between 180 and 110 years before the Exodus (E). During the Mon­archy, longevity continues to slowly drop. The maximum age is 70 years for David, while it is only 36 for Ahaz. 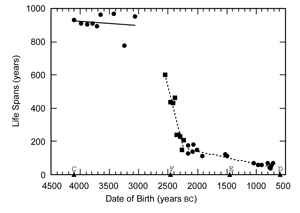 So, there appear to be 3 distinct periods in the data: (1) the antediluvian, when lifespans were very high but very similar to each other, (2) a transition period after the Flood, when longevity dropped very fast, and (3) the postdiluvian period from Abraham to the fall of Jerusalem (D) when the age at death slowly but steadily continued dropping to values more consistent with populations in the near past. Figure 2. Same as in Figure 1 but with straight-line segments fitted to the three major periods of the data. Figure 2 shows the same data as in Figure 1 but the 3 periods are marked by different symbols. In addition, straight-line segments have been fitted to each of the 3 periods. The slope of the antediluvian segment is only -0.03 years of age per year; the transitional is -1.42, and the postdiluvian -0.07. Notice how regular is the drop in age in the transition and postdiluvian periods. The correlation coefficients are 94 and 93 %, respectively. The prediluvian period shows much more scatter (correlation coefficient is 16 %), due principally to the short lifespan of Lamech. However, the other antediluvian ages do not show much variation among themselves. age at death slowly dropped to recent historical longevity values over a period of about 1500 years. The data points define very closely a sigmoid curve, typical of processes that are initially stable; go through a period of rapid monotonic change, and slowly stabilize again at a much different value. This orderly pattern and sharp regularity of the lifespan data with time does not support the contention that Old Testament longevity values are wilfully assigned random figures or represent obscure mythological remnants of a dim past. A principal factor that determines the distribution of lifespan in a population is the process of ageing or senescence. Thus, it is reasonable to expect that the changes with time in the lifespan of the patriarchs and rulers of the Old Testament may correspond to changes in the ageing process at different periods. Therefore, it is important to consider some of the characteristics of ageing that determine life expectancy in a population. Ageing is the progressive loss of ability to cope with the demands and risks of life. It is usually reflected in a decrease with age of the metabolic rate, of the ability to respond to stimuli, and of the ability to move, work, and reproduce. In addition, there is an increased vulnerability to disease and injury. In ageing, some of the cells that cannot reproduce themselves (as in the nervous and endocrine systems) degenerate and their functionality is reduced or lost completely, or they may die. In addition, there is ageing of organs and tissues composed of rapidly reproducing cells (skin, immune system, liver, bone marrow, etc.) when their stem cells deteriorate and cannot produce new cells to replace those that die in the normal course of life. This loss of reproductive ability causes disorganization of the structure of the organ with a resulting loss of functionality. Cellular degeneration may be caused by (1) accumulation of deposits such as collagen, calcium salts, pigments, etc., (2) accumulations of mutations in the genetic material, or (3) cell damage or destruction such as by injury, disease, normal wear and tear, etc. One important consideration is that the loss of functionality of the body and its vulnerability to external risks increases with age. Therefore, the rate of mortality increases with age. Infant mortality tends to be much higher than that of adolescents, especially in developing countries where it can be as high as 10 % (100 per 1000) per year for newborns. The mortality rate then drops very fast with age, and by puberty it has reached the lowest levels it will attain. From then on, it gradually increases. Although actual plots of mortality rate against age vary from country to country, especially in childhood and adolescence, the curves gradually resemble each other with increasing age and reach an approximate exponential form with the same exponential rate of increase of about 9 % per year. where m(x) is the mortality rate at age x, A is the initial mortality rate at age 0, and G is the Gompertz constant, the exponential rate of increase in the mortality rate with increasing age. The Gompertz constant actually represents the effect of ageing. A nonscenescing population would have a Gompertz constant equal to 0. 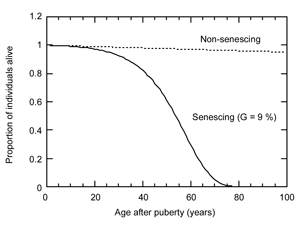 In the equation, age 0 applies to the time of puberty because, in empirical situations, the mortality rate normally decreases from birth to puberty as explained above. 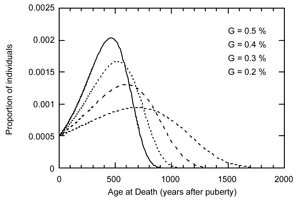 So, the initial mortality rate A corresponds to the mortality rate at puberty (x=0). Figure 3 shows a plot of equation (1) for a Gompertz constant of 9 % per year and an initial mortality rate of 0.05 % per year at puberty (about 15 years of age). For comparison, the dashed line represents the case when the mortality rate does not increase with age and stays constant at 0.05 % per year. Notice the rapid increase in mortality beyond 70 years after puberty. This curve is a fairly accurate representation of the mortality in North America and Europe today. It does not take into account, however, the large values of mortality in childhood nor a slight stabilization in the mortality rate that tends to occur from 20 to 30 years of age. Nevertheless, it is a good general model to study the effect of variations in the rate of ageing represented by the Gompertz parameter. Figure 4 shows equation (3) in graphical form. It represents life curves giving the proportion of individuals alive at different ages after puberty. The solid curve corresponds to a Gompertz parameter of a 9 % increase in mortality rate per year of age. The dashed curve is for a nonsenescing population when the Gompertz constant is 0. The initial mortality rate at puberty is 0.05 % per year. It can be seen that after about 40 years beyond puberty, the proportion of individuals remaining at greater ages rapidly decreases because the mortality rate increases very fast and the population is still high. For ages of 70 years or more after puberty, the drop in the proportion of individuals remaining slows down because, although the mortality rate is very high, the number of individuals in the population at those ages is small. 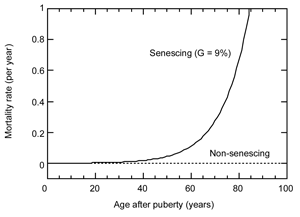 The nonsenescing case shows a slow and monotonic drop in the proportion of individuals alive at higher ages, as the mortality rate is constant and small. Figure 5. Mortality curve showing the proportion of individuals dying at different ages after puberty, or, conversely, the proportion of individuals surviving up to a particular age. The curve corresponds to a Gompertz parameter of a 9 % increase in mortality rate per year of age. The initial mortality rate at puberty is 0.05 % per year. where dx is generally taken as one year. 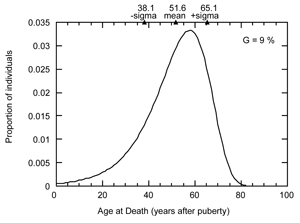 Figure 5 shows such a mortality curve corresponding to a Gompertz parameter G of a 9 % increase in mortality rate per year of age after puberty. The initial mortality rate A is 0.05 % per year. The most frequent age at death under those conditions is between 55 and 60 years after puberty (70 and 75 years of age if puberty is assumed to be 15 years). The rise to the modal peak results from the increase in mortality rate in the early ages while the surviving population is still high. Frequencies drop after that peak because, although the death rate continues to increase, the surviving population has dropped considerably (Figures 3 and 4). The mean lifespan is 51.6 years after puberty and the standard deviation is 13.5 years. This corresponds to a fairly narrow distribution. By 95 years of age virtually all the population has died. Although the theoretical distribution calls for very small percentages of very high ages (meaningful only in very large samples) there is a natural maximum age limit of about 120 years in present day populations. there appears to have been an upper limit to longevity. Whether or not the mortality rate actually increased expo­nentially with age, as is true today, is difficult to test because of the limitations of the sample. How­ever, there is no reason to expect it would be other than exponential. Figure 6. Mortality curves for different Gompertz parameters from G=9 % to G=1 %. The initial mortality rate at puberty is 0.05 % per year in all cases. Notice that the curve for G=9 % is the same as that shown in Figure 5 but with a much compressed abscissa. It is very instructive to explore what type of longevity distributions would result if the ageing or mortality parameter G were changed in the model and to compare those with the longevity values in the different periods of our sample. Figure 6 shows four plots of equation (5) for different Gompertz parameters, G. The initial mortality rate (at puberty) was kept at 0.05 % per year in all cases. For comparison with the others, the curve from Figure 5 (G=9 %) has also been included. Notice that with decreasing mortality rate, G, the modal value of the distribution of age at death shifts toward longer ages. The curves likewise become flatter and more spread out. The practical upper age limits also become very large with decreasing G. The shift in modal peak and increase in spread occur because the smaller increase in mortality rate with age for small G produces a slower increase in the number of deaths with age, and also allows for longer age periods before the population drops to levels that can only support smaller and smaller numbers of deaths. Figure 7 is a similar plot of equation (5) but for values of G from 0.5 % to 0.2 % per year. Again, the modal peak shifts toward longer ages, with decreasing G and the curves flatten out. Ages of 900 to 1800 years are now possible with nontrivial frequencies. For values of G less than 0.2 % per year (plots not shown), the modal values shift back toward smaller ages and the curves approach a straight line. In the limit, when G becomes zero, the curve becomes a straight line gently sloping down from a value of 0.05 % per year (the initial mortality rate) at age zero. This corresponds to a non-senescing population where the mortality rate stays constant for all ages and the same proportion of individuals dies at every age. The population slowly decays in a linear fashion with time. The antediluvian sample (777 to 969 years) falls comfortably within the G=0.3 % distribution in Figure 7 between the 77th and 94th percentile. That curve, however, still calls for ages of about 1300 years with a frequency of about 1 in 100,000 individuals. The curve for G=0.4 % contains the antediluvian range in a more extreme position within percentiles 92 and 99.6. The distribution calls for the far end value of 1050 years with a frequency of about 2 in 100,000. It appears then, that the antediluvian sample could be reasonably placed within an ageing population with a Gompertz parameter from 0.3 to 0.4 % as modelled by equation 5, under the assumptions of an exponentially increasing mortality rate, and with an initial value of 0.05 % per year at age 15. 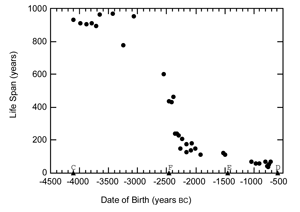 The second group of ages, between Shem and Terah, varies between 600 and 148 years but the points describe, as already indicated, a fast, almost linear, drop in longevity from pre-Flood times. It is thus difficult to place the sample in one particular mortality curve. If the midpoint (about 380 years) is used, one can see from Figure 6 that a distribution with a value of G of about 2 % would be needed to adequately accommodate that age. The beginning of the third group of ages (about 180 years) could be explained by values of G of about 3–4 %. 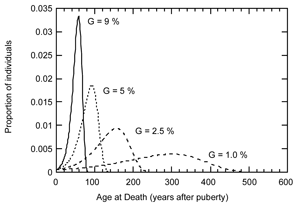 Ages after the Exodus correspond to mortality curves with present day values of G around 9 %. Thus, it could be hypothesized that there was a progression from antediluvian to recent times when the mortality rate G increased from values in the low tenths of a percent before the Flood, to values in the low units in the transition period, to values approaching the present day maximum of 9 % in the later part of the record that ends with the fall of the kingdom of Judah. Again, this hypothesis rests on the assumption that there was an ageing process where the mortality rate increased logarithmically with age and that there was an initial small mortality rate of 0.05 % per year at puberty. Because of the small size of the age-at-death sample used, and its non-random nature, this is basically the most that can be inferred about ageing and mortality in the Old Testament at different periods. It is generally believed that the ageing process is genetically controlled and that there is a similar pattern of ageing, and a fixed upper limit of longevity, that is pre-programmed in the genetic material of every individual. The details of how this works are not clearly understood at this time and much research is going on in this area. One important development has been the discovery of telomeres.5 It has been observed that human cells that retain the ability to divide and reproduce themselves after maturity are limited in the number of times they can do so; normally 80–90 times during the life of an individual. After that limit is reached, they cease dividing and if there is cell destruction or deterioration in a tissue, they cannot produce replacements. Apparently there is a cap or termination at the end of each chromosome, a structure called a telomere, that controls how many times a cell line can divide to produce new daughter cells. With every division, the telomere is shortened, so the daughter cells have one less opportunity of dividing again. When a certain limit is reached, no new cells can arise from that particular cell line. Thus, tissues and organs that loose the ability to replace cells that are damaged or die will loose their functionality and the body will ultimately die. The longer the telomeres of an individual, the longer it will live before its organs lose the ability to recover from deterioration, trauma or disease. Theories of what causes ageing in the human body fall into four broad categories: cell-environment, metabolic, genetic and immunological. The cell-environment theory focuses on changes with age in the near environment of the cells such as deposits of collagen or calcium salts, and the increase of fibrous tissues in different organs. These changes result in an increasingly less favourable environment with age for the living cells. In the metabolic theory, the emphasis is on the deterioration of metabolic functions with age which results from the continued use of the organs and external stresses on the body. One example is the production of oxygen-free radicals by damaged tissues which in turn can cause further cell damage or destruction. The genetic theory points to the accumulation of mutations in the cells of the body that can interfere with the correct control of gene expression. The immunological theory stresses that mutations occurring during the lifetime of an individual may change the immunological attributes of some cells. Other cells will then reject and kill or isolate them with deposits, resulting in the decrease in functionality of different tissues with time. It is probable that the ageing processes envisioned by all of these theories are simultaneously occurring in the human body. These differing explanations of the causes of ageing are an expression of the usual argument between nature and nurture that so often arises when accounting for biological and behavioural phenomena. The four theories of the processes that cause ageing cited above reflect the ‘nurture’ side of the argument. These theories emphasize that external effects connected to the normal course of human life with its stresses, traumas, diseases, and adverse environmental factors, are responsible for cell deterioration and destruction, leading to ageing and eventual death. There is a large body of observations and studies that gives support to these theories. Because the process of ageing appears to have different and characteristic patterns and longevity limits for different types of organisms, it is almost inevitable that there must be some genetic controls that determine the overall course of ageing and the length of life. This brings us to the ‘nature’ side of the argument. 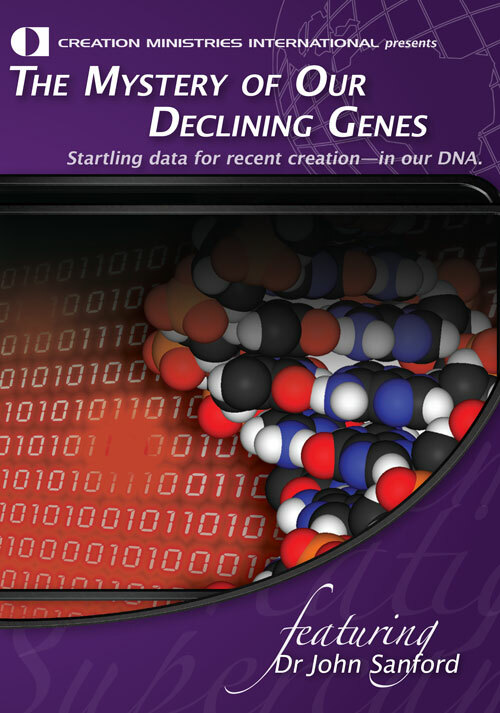 Genetic pre-programming could determine the degree of resistance to cell environment and metabolic deterioration, as well as to genetic and imunological damage. It could also determine the ability of certain cells to repair themselves and to substitute for destroyed neighbours in the case of tissues that retain the ability of cells to divide after maturity. Genetic controls could limit the number of times cell lines or stem cells can duplicate. Abnormal ageing, such as in cases of progeria (premature ageing) in both infants and adults (Werner’s syndrome), appears to be related to genetic mutations. That, and the existence of long runs of generations with statistically significant long lives in some families, are also strong arguments for genetic controls of human ageing. The recent discovery of telomeres, which control the number of times certain cells can duplicate themselves during the lifetime of an individual, is an additional powerful evidence for the ‘nature’ explanation. Both ‘nature’ and ‘nurture’ effects are probably important in controlling the ageing process and determining longevity. Even in the case of a population of organisms with ‘bad genes’, providing for slight resistance to external damage and limited ability to repair and replace damaged and destroyed cells, those organisms could live to long lives provided there were few or no adverse external stresses and risks. Of course, we know that a completely riskless situation is not possible in our present world because of the curse imposed by God upon the Creation as the result of sin. On the other hand, a population with ‘good genes’ can not achieve its full potential of extremely long life or immortality because of the presence of disease, trauma, life-style abuse, stresses, hard work, and both man-made and natural environmental hazards. What then happened after the Flood that accelerated the ageing process by almost two orders of magnitude and resulted in a dramatic shortening of human life? First of all, we must realize that we are dealing with a non-reproducible and non-testable situation. Thus, all we can do is speculate about an explanation that is based on the information given in the Bible and what we can know of the ageing process as it occurs today. We can check the plausibility of our explanations by testing some of our assumptions, inferences, and deductions against present day observations, and this should be done, but we cannot prove our explanations. (1) Progressive changes in the genetic control of ageing. These changes could relate to the cells resistance to damage, their ability to repair damage, and (in some types of cells) their ability to duplicate themselves and replace damaged neighbours. (2) Progressive changes in environmental conditions that would accelerate cell-environment, metabolic, genetic, and inmunological deterioration. Or conversely, gradual elimination of environmental conditions existing in pre-Flood times that were favourable to healing and repair of injuries and normal wear and tear. The inherited mutations explanation tacitly assumes that environmental conditions after the Flood were more conducive to genetic mutations than before. This scenario is somewhat difficult to explain since Shem, the son of Noah, born before the Flood but spending the majority of his life after it, already showed a substantial decrease in lifespan, as did his immediate descendants. In this scenario, the accumulation of inherited mutations must have been very fast in view of the rapid increase of the rate of ageing shortly after the Flood. The population dynamics explanation is easier to visualize. It is well known that small populations that become isolated can become genetically very different from the larger parent population because their gene pools usually contain only a small fraction of the genetic variety originally available, and because it is very likely that some gene combinations will disappear from the small group.5,6 The original post-Flood population consisted of only four couples and it would have been a prime candidate for these effects. In the case of ageing, genes or gene combinations that would provide for slow ageing and long lives could have progressively been lost because of Mendelian population dynamics if the population was very hetero­zygous. This presupposes that genetic traits resulting in fast ageing and short lives (comparable to those observed now) were originally present before the Flood, and that the genetic drift after the Flood was towards shorter lives. There are, however, some difficulties with this explanation. First, there is no biblical mention of any short lives before the Flood. The fact that Shem’s life was much shorter (600 years) than that of his father Noah (950 years) is no proof for the existence of short lives before the Flood since, conceivably, his shorter life could have been due to different environmental conditions after the Flood (he spent most of his life after the Flood). 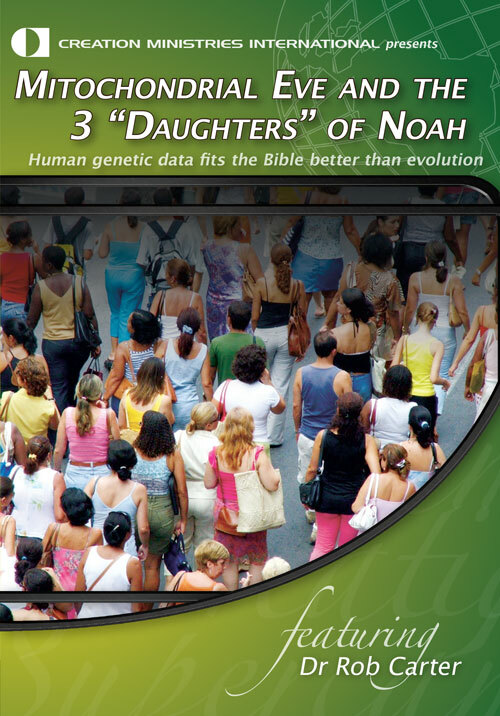 Another problem with the genetic drift explanation is that Noah’s lengthy ancestry as recorded in the book of Genesis is all very long-lived with the exception of Enoch whom God took, and thus it would be very strange if he was very heterozygous in ageing-controlling genes. It would then be necessary that Noah’s wife was such, which would imply that he probably married outside of his family circle, the genealogical line of the Messiah. Even if this speculation is correct, the fast drop in lifespan right after the Flood calls for a very rapid loss of longevity genes during a very short time. One would expect a more gradual loss in a process that depends on a random sorting of random genetic combinations. It also sounds strange that for the first time in centuries, a member of the chosen line (Shem), born before the Flood, would have such a relatively small lifespan. If that reduction in lifespan was genetically induced, the wife of Noah must have come from quite a different line to that of Noah’s family. The environmental explanation is based on postulated changes in the environment triggered by the Flood and subsequent earth-atmosphere adjustments. The post-Flood biosphere is seen as becoming progressively more conducive to cell deterioration and destruction and less favourable for cell repair and replacement. One important aspect of this hypothesis is the increase in the number of damaging mutations that the somatic cells of an individual would experience during their lifetime after the Flood. Some creationists have proposed the existence of a dense water vapour canopy in antediluvian times, which was destroyed during the Flood, and subsequently replaced by a much thinner and lower one.7,8 It has been hypoth­esized that the increase in atmospheric pressure at the surface of the earth due to the additional weight of the water vapour canopy could have made possible a larger supply of oxygen to organisms allowing them to live longer, healthier lives.7,9 In terms of the ageing process, this would have been favourable for the healing and repair of injuries and the slowing of tissue deterioration. An increased amount of water vapour at high elevations in prediluvian times could also have increased the rate of production of oxygen by the photochemical dissociation of water molecules by ultraviolet radiation. This additional oxygen at high elevations could have been used in turn for the increased production of ozone that would have intercepted much more ultraviolet radiation than at the present time. The increase in the rate of mutations after the Flood could then be explained by an increase in the levels of ultraviolet or x-ray radiation reaching the biosphere after the canopy was destroyed. Recently there have been efforts at modelling the effect of water vapour canopies on the climate of the earth.10,11 Numerical radiance programs have been used to calculate temperature profiles for different canopy thicknesses. Although the resultant temperature profiles suggest stable canopies, the resulting surface temperatures are too high to support life. The models only considered pure radiative equilibrium with no clouds or convective adjustments included. Reflection from the top of cloud layers within the canopy could reduce the incoming solar radiation with a consequent cooling of the surface temperature. Convective processes in the troposphere could also reduce the surface temperature by conducting heat towards higher layers and modifying the vertical temperature profiles. In addition, the models did not include the effects of three dimensional global circulations that can transport heat vertically and horizontally away from areas of higher surface temperature towards polar areas where the canopy would have produced less heating due to zonal gradients of incoming solar radiation. As the authors of the modelling efforts quoted above recommend, more studies incor­porating these additional factors should be done. In addition to these questions about the likelihood of the existence of the water vapour canopy, other criticisms arise because there are no experimental tests on changes on the longevity of organisms raised under high oxygen partial pressures, and shielded from background radiation. Objections have also been raised because lifespans did not drop quickly after the Flood to present day values but rather followed a gradual descent. Actually, Figure 1 shows that right after the Flood there was a very rapid drop with a more gradual decrease later on. This non-instantaneous effect could conceivably be attributed to a period of initially fast and then slower adjustments in the hydrological balance of the earth-atmosphere system as implied in the existence of the Ice Age fluctuations. All of these explanations have appealing points but also many difficulties. The life spans reported in the Old Testament have been analyzed in order to understand the longevity distribution at different periods and its change with time. The data clearly define a sigmoid curve with an orderly pattern and sharp regularity of the lifespan data against time which does not support the contention that Old Testament longevity values are mythological or confabulations of the Hebrews. The Old Testament life-spans were interpreted in the light of the ageing process in modern populations. Ageing can be characterized by an increase in mortality rate with age. The increase has been found to be exponential and can be expressed by the Gompertz formula. The longevity values in the different periods of the Old Testament sample were compared to longevity distributions with different mortality rates. This analysis indicates that the changes in longevity in the Old Testament could be related to an acceleration of the ageing process since the Flood, resulting in an almost a hundred-fold rise in the rate of increase of mortality with age. At this point it is very difficult to reach any firm conclusion, and much research is needed before we can understand the drastic acceleration in the ageing process after the Flood. I would like to express my gratitude to my wife Evangelina V. López for her patience and support while I was working on this paper and for her assistance in reading the manuscript and offering many suggestions for its improvement. I am also indebted to my son Raúl E. López, M.D. for reviewing the paper and for offering valuable suggestions, especially concerning cellular mechanisms involved in ageing. Finally, I would like to dedicate this paper to the memory of my ninety year old father Eladio López Tirado who, in his recent passing away, taught me so vividly, as his last life lesson to me, how inexorable and forceful is the passage of ageing and death in human life. López, R.E., The antediluvian patriarchs and the Sumerian King List, Journal of Creation 12(3):347–357, 1998. Return to Text. A late date of 1290 BC for the Exodus has also been proposed. A summary discussion of the arguments for the two dates can be found in: Hill, A.E., 1981, Guide to Bible Data, Word Publishing, Grand Rapids, Michigan, pp. 287, 1981. Return to Text. Most of the material for the section on ageing and mortality has been obtained from Ricklefs, R.E. and Finch, C.E., Ageing: a natural history, Scientific American Library, a division of HPHLP, New York, p. 209, 1995. Distributed by W.H. Freeman and Company, NewYork. Return to Text. In honour of Benjamin Gompertz who first described the exponential growth in mortality with age in England in 1825. Return to Text. Wieland, C., Living for 900 years, Creation 20(4):10–13, 1998. Return to Text. Wieland, C., Decreased lifespans: have we been looking in the right place? 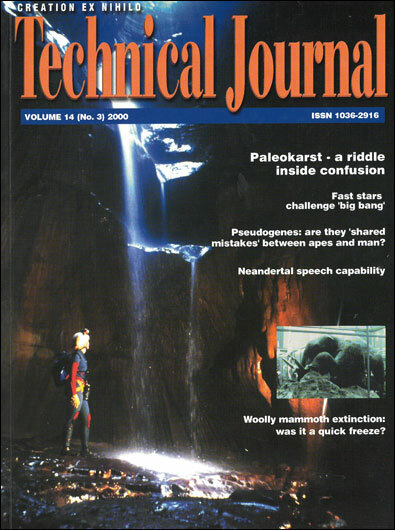 Journal of Creation 8(2):138–141, 1994. Return to Text. Whitcomb, J.C. and Morris, H.M., The Genesis Flood, Presbyterian and Reformed Publishing Co., Philipsburg, New Jersey, p. 518, 1970. Return to Text. Dillow, J.C., The Waters Above: Earth’s Pre-flood Vapor Canopy, Moody Press, Chicago, p. 479, 1981. Return to Text. Vardiman, L., The sky has fallen; in: Walsh, R.E., Brooks, C.L. and Crowell, R.S. (Eds. ), Proceedings of the First Conference on Creationism, Vol. I, Creation Science Fellowship, Pittsburgh, PA, 1986. Return to Text. Vardiman, L., Pre-flood vapor canopy radiative temperature profiles; in: Walsh, R.E. and Brooks, C.L. (Eds. 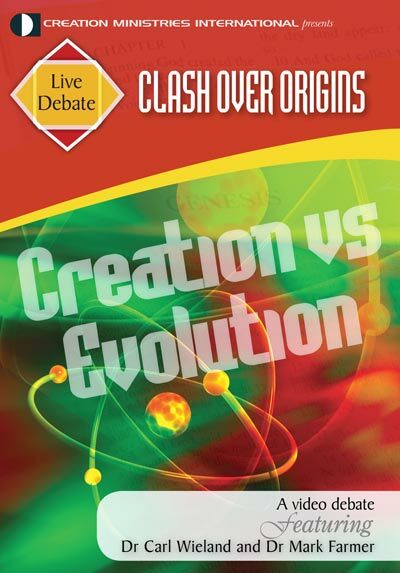 ), Proceedings of the Second Conference on Creationism, Vol. II, Creation Science Fellowship, Pittsburgh, PA, pp. 231–245, 1990. Return to Text. Vardiman, L., Sensitivity studies on vapor canopy temperature profiles; in: Walsh et al. (Eds. ), Proceedings of the Third Conference on Creationism, Creation Science Fellowship, Pittsburgh, PA., 1998. Return to Text.